Over the span of the last nineteen years, since he was five years old, Reid has been a player, a deck builder, a collector, and a lover of the Magic world. Today, he’s a full-time professional Magic player and writer. My father spent thirty years as a painter and a carpenter, and he's always taught me that "There's a right tool for every job." An expert at what he does, I believe he could've painted the Sistine Chapel's ceiling with a Swiffer Wet-Jet Mop, but such a thing would never happen with my dad. Instead, he had painstakingly built up an enormous collection of paint brushes, ranging from giant rollers for walls and ceilings; to medium-sized brushes for doors; and tiny, pin-point brushes for corners and fine details. If ever I'd get lazy in helping my father paint and fail to find the right brush when I changed from one task to the next, he'd immediately pause the project and insist that nothing more be done unless it was going to be done right. In Magic, Line-Up Theory teaches us how to use the right tool for the right job. As a child, full of impatience and false confidence, I found my father's paintbrush system annoying and unnecessary. Today, I'm incredibly thankful for the values it instilled in me. You see, if I made a mistake while painting it might mean an extra trip to Lowes for a new brush or some more paint. In Magic, you get one chance and there's no turning back. If I waste my Hero's Downfall on my opponent's Siege Rhino instead of using Murderous Cut, then I can later lose to his or her Elspeth, Sun's Champion and be out of the tournament. Take great care to line up your answers correctly against your opponent's threats. Make it as difficult as possible for your opponent to do the same against you. Line-up theory is used to inform your long-term planning. Sometimes, in a lightning-fast game against a red aggro deck, you just do whatever you can to survive in the moment. However, the longer games drag out, the more important it becomes to answer each of your opponent's threats in the best possible way, and in doing so to be prepared for what your opponent is likely to throw at you later. Often, this means being patient. It means not going for the quick win, or it means taking a bit of damage from your opponent's creature. It's going to be tempting to use Bathe in Dragonfire on your opponent's Smoke Teller, but first ask yourself if there might be a different way for you to answer it. Perhaps it's best to save your Bathe in Dragonfire for a flying creature later? Perhaps your best course of action is simply to let Smoke Teller attack you for a couple of turns to see if you draw a creature that can block it? You'll know the answer to these question once you begin to think in terms of line-up theory. In the most extreme and pure form of line-up theory, you consider your whole deck against your opponent's whole deck. Here's an example from Standard that I encountered very recently. Consider the following two decks. These are both control decks, but the UB (blue-black) deck is more dedicated to the control game plan, opting for extra counterspells where the Sultai (black-green-blue) deck has Satyr Wayfinders and more Planeswalkers. Jelger's strategy for the matchup is the most extreme form of line-up theory. He looked at both decklists and saw through the distractions to the factor at the very core of the matchup—that the Sultai deck only had a small handful of cards that could actually win the game! If he could save his Disdainful Strokes, Dissolves, and Hero's Downfalls for only those cards, his opponent would be helpless! This use of line-up theory ties in closely with inevitability. The matchup between UB Control and Sultai typically goes long. If it goes long enough, and the UB Control player employs line-up theory, he or she will always win, because the Sultai player simply doesn't have enough cards in his or her deck to overcome the UB player's answers! But what if the UB player doesn't employ line-up theory? Imagine ten-year-old Reid going straight from using the wrong paintbrush to playing a control mirror in Magic. Maybe the Sultai player misses a couple of land drops in the early game, so Reid decides to Dissolve two Satyr Wayfinders. On turn six he uses a Disdainful Stroke on a Dig Through Time, and on turn eight he makes the same play. Several turns later, a Thoughtseize clears the way for a Garruk, Apex Predator, and the Sultai player manages to win the game. This example illustrates the importance of line-up theory and how much you might be missing if you ignore it. Because of the contents of both decks, and the Sultai player's slow start, it should've been all but a foregone conclusion that the UB player would win. Little-kid Reid made reasonable decisions at every point in the game. All of the spells that he countered seemed relatively important, and he didn't make any obvious blunders. However, because he failed to look at the big picture, he opened a door for something to go wrong, and it cost him the game. UB Control is the most controlling deck in Standard and has inevitability in nearly every matchup. It's a perfect deck for employing whole deck vs. whole deck line-up theory. However, an understanding of line-up theory can also be helpful for playing against UB Control as well. Let's take a look at things from the perspective of the Sultai player. The Sultai player has a challenge on his or her hands. The UB player has inevitability, and simply by looking at the two decklists next to one another, it seems clear that the UB deck "should" win. It should win, that is, unless the Sultai player is able to make something special happen. 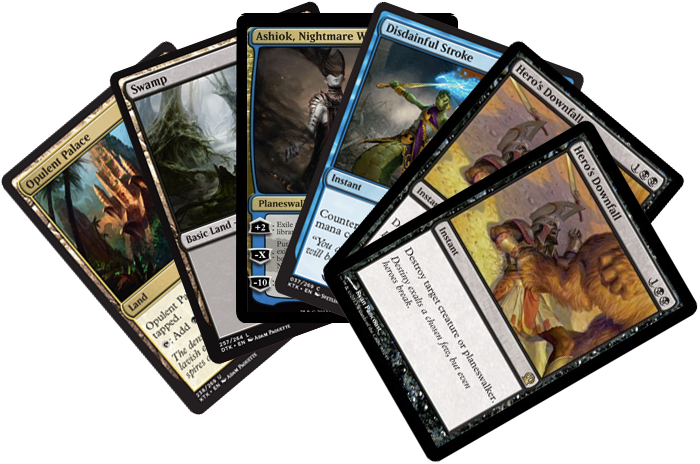 The Sultai player can still benefit from a good understanding of the whole deck vs. whole deck line-up. He or she should watch to see whether or not the opponent is employing a strategy based on line-up theory. Against ten-year-old Reid, it might have been clear very quickly that he wasn't being careful enough with his permission spells and wasn't playing for the long game. There might be a way to exploit such an opponent and turn the tides in your favor. Once a number of permission spells are gone—either wasted on frivolous spells or milled with a couple lucky activations of Ashiok, Nightmare Weaver—it is possible for inevitability to shift from the UB player to the Sultai player. The Sultai player must watch carefully to take advantage of such a situation if it should ever come up. But the Sultai player doesn't exactly want to count on this, since it depends on either a fluke of the draw or on the opponent making a mistake. Let's say you're playing Sultai and you get paired against Jelger Wiegersma, who is playing UB Control and who you know (from reading this article) has a good understanding of the whole deck vs. whole deck line-up. How can you try to earn a win? I recommend employing hand vs. hand line-up theory. In doing so, you're neither playing for the ultra-long-term, nor are you rushing things. Instead, you're considering the resources that each player has immediately available and trying to find an advantage by lining them up properly. You're on the draw. On your second turn, you each have two lands in play and you cast Thoughtseize. Let's use this Thoughtseize as an exercise in line-up theory. For starters, you know based on the whole deck vs. whole deck line-up that you do not have inevitability, and that it's therefore in your best interest to force the action. You know based on the hand vs. hand line-up that you have Hero's Downfall to answer your opponent's Ashiok, Nightmare Weaver and that you have Disdainful Stroke to answer your opponent's Jace's Ingenuity. 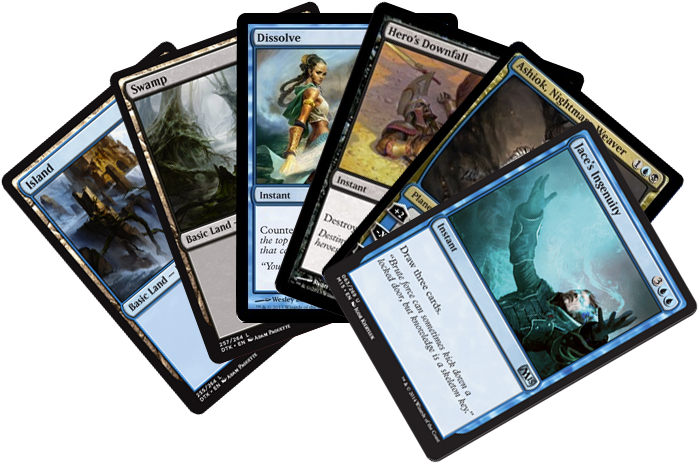 All things considered, you'll want to take away either Dissolve or Hero's Downfall, since those are the answer cards that are allowing your opponent to line-up properly against your Ashiok. If you think your opponent might tap out to play his or her Ashiok on turn three, you could take Hero's Downfall. Otherwise, you should take Dissolve. Then, instead of running out your Ashiok right away, you might consider holding the card in your hand for a while. The reason is that if you wait, you can draw another Thoughtseize and line it up against Hero's Downfall, creating an opening for your Ashiok. However, if you trade Ashiok for Hero's Downfall right away, then you've given up the opportunity to trade a Thoughtseize for the Hero's Downfall should you draw one. You're not guaranteed to win this game, but this is the line of play that lines up the cards in your hand against the cards in your opponent's hand as well as possible. It gives you the best chance of winning a game in an otherwise unfavorable matchup. Thoughtseize makes for some clear examples of hand vs. hand line-up theory for the obvious reason that you get to see your opponent's hand. (For a lengthier discussion of Thoughtseize, and how it relates to line-up theory, check out "Thoughtseize You.") However, you should be employing the same thought processes even when you don't know exactly what's in your opponent's hand. Imagine you're playing Abzan against a red-white deck and your opponent casts Goblin Rabblemaster. You know you're going to kill it with either Bile Blight or Ultimate Price, but you need to decide which one to use. This is an example of hand vs. hand line-up theory! The answer will depend on the details of the situation. Do you think your opponent has Hordeling Outburst? Do you think he or she has Stormbreath Dragon? Does your hand have a way to beat one or the other of these cards? Is your deck particularly well suited for beating one or the other of these cards? The answer depends on what tools you and your opponent each have at your disposal, and that's really what's at the heart of line-up theory. In Constructed, you should basically always be thinking in terms of hand vs. hand line-up theory. Whole deck vs. whole deck line-up theory is still tremendously helpful, but is only applicable to relatively extreme matchups. Both are very important in Limited. In Limited, there's also the extra challenge that you often know very little about the contents of your opponent's deck. You don't always know which player has inevitability, or what "must-answer" cards your opponent might have access to. That said, Limited games frequently go long (especially in Sealed Deck). When a game is shaping up to go long, being patient and employing line-up theory can greatly improve your chances. There was an old saying from the early days of Limited Magic that you should, "only use a removal spell on a creature that's going to kill you." Today, Limited games are a little faster and tempo is a little bit of a bigger concern than it used to be. I don't recommend taking this saying as gospel. However, there's most certainly a good lesson to be taken from this extreme approach to the game. Remember the example of the Smoke Teller and the Bathe in Dragonfire? Well, Bathe in Dragonfire is an extremely good Limited card, particularly because of its ability to line up well against a variety of threats. Consider this all-too-common sequence of events. Johnny is on the play, but doesn't play a creature on turn one or two. Jenny plays Smoke Teller on turn two. Johnny casts Bathe in Dragonfire on the Smoke Teller. Johnny plays Salt Road Patrol, but eventually loses to Jenny's flying creatures. What went wrong in that story? Well, it seemed that Johnny wasn't employing line-up theory. Salt Road Patrol is an absolutely perfect tool for answering Smoke Teller, but Bathe in Dragonfire was Johnny's only tool for answering a flying creature. In Sealed Deck, you should typically expect your opponent to have one or more bomb rares in his or her deck. Although you don't exactly know what it will be, you should maximize your chance of being prepared for it when the time comes. In other words, there might be other ways to beat your opponent's Summit Prowler, but you're going to desperately need your Reach of Shadows for when he or she plays Atarka, World Render. In Game 1, you should use your best judgment, but err on the side of patience and preparedness. For Game 2, after seeing a card like Atarka, you might begin to employ whole deck vs. whole deck line-up theory and say, "I'm saving my Reach of Shadows for Atarka and I refuse to use it on any other creature." As my father said, "There's a right tool for every job." Beating a card like Atarka, World Render requires a very special tool, and you don't want to be caught without it. Always look for the best ways to line up your answers against your opponent's threats. Be careful and patient, and give yourself the best chance to be prepared when the time comes.